I have worked with many individuals at all levels, from people just getting into the sport or training for fun and fitness, people just getting into racing, and up to elite level riders attending national level races such as Elite Road Nationals or Cyclocross Nationals. I first discovered my love for two wheels, probably as soon as I was allowed to stray, I still remember that shiny red tricycle! From there the obsession only got worse, and before long, I was on my bike every day from a young age. But wait, there are more things that have led to my experiences as a bike racer than life on a tricycle. My real age as a bike racer was started when I was highly involved with music. The bassoon, to be specific. I have had music in my genes as far back as I know. My musical background took me from my home state of Oregon to the California Bay Area to attend the San Francisco Conservatory of Music. While I was attending the Conservatory, I started commuting to and from on my bike daily. From there, my time spent on two wheels would grow and grow. I started studying up on all the info I could find on training, riding, and as I started to get into group rides, racing. Once I got the bug for racing, there was no turning back. I decided to devote myself to becoming as fast as I could. After my time at the Conservatory, I moved back to Oregon to attend school at the University of Oregon. Here I earned a degree in Economics. I also spent a large part of my time devoted to keeping up on the latest information on training and physiology to supplement my goals as a cyclist. 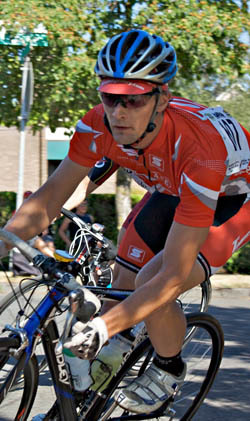 But a degree in Economics paid out enormously well as a cycling coach as well – all that statistical work in Econometrics provides a number of excellent tools in assessing the information gathered from power and heart rate files, since most of the tools associated with reading data from workouts is directly out of statistical work . Most of time spent coaching is comprised of comparing actual values with past values, expected values and working to forecast future values based on what I am seeing. Using this info I work to assigning appropriate values to work with in the present that should support a given trajectory of improvement based on scientific data that has been proven to create great success in ones development. Phrased like that, its hard to decipher whether the topic is relating to econ or sports performance. Luckily, my love of and experience in training and racing when paired with these tools have proven to be great tools to work with while coaching people of all ages and abilities. In addition to school, I started working with friends and new riders, helping them get into the sport and began to coach riders coming into the sport. Getting a coach is about having a pro balance training to fit into your lifestyle to help you get the most improvement possible. My job is about looking at your goals, and helping to fit training to meet your goals with the time and resources you have available to train. A lot of people think being a coach means I am only working with professional athletes, but the truth of the matter is that most of the individuals I work with are full time business professionals, with familys, kids, and a busy work life. They may only have 6-10 hours a week to train, its my job to set up their training to make those hours count and get as much improvement as we can with limited time and resources to devote to training. After I began coaching full time, I decided I wanted to be able to provide more support to those I am working with and went back to school to become a Licensed Massage Therapist. With massage therapy, I am able to help athletes recover from injuries, improve their sports performance and well being. In addition to coaching and massage, I have worked to help coordinate many events, race promotion, clinics and other behind the scenes work. Its important to help keep great opportunities in place for people to participate in, or learn more about the art of training, well being or racing, and I often find myself in position to contribute support in putting these together. I am a coach and massage therapist at Upper Echelon Fitness, where I am a part of a team of experienced professionals with the common goal of supporting individuals of all levels in their pursuit of a healthy lifestyle. 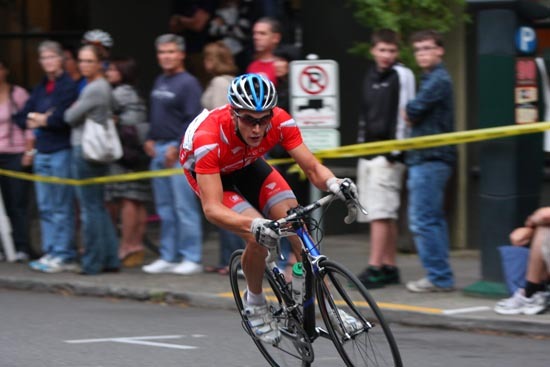 I race and help manage a phenomenal elite team at Team Oregon, and we have created a team that has become a top development team in the northwest. In addition to developing riders from new racers to category 1 elite riders, Team Oregon is maintaining one of the best elite teams on the west coast. Keep checking the site for articles to help improve your racing, training and fitness and better understand your body and benefits of specific massage work! but overall it seems to be a greater benefit than hinderance to most athletes. Some of the benefits for cyclists include: increased power, improved joint stability, opportunity to improve muscle imbalances, weight bearing activity for bone density. For some people its just a good way to mix up their training as well and allow a bit of a break from being on the bike all the time, which many riders may find important to maintaining long run focus in training. Here are some key guidelines to keep in mind as you look at what you want to include in a weight program. I think these are the key fundamentals in seeing just why strength fits into the season of an endurance athlete, and helps maintain your focus on the correct ideas when training. Range of motion – it is very important to have healthy ranges of motion while lifting, so be sure you are flexible enough to safely lift properly. Most lifts out there take you through a full range of motion of whatever joint (or joints) are being focused on, but its good to keep in mind that achieving full range of motion while lifting is a major goal of most lifts. Ensure you are doing the full range of motion of the lifts, and not shortening the range. Supporting muscle groups – you want to improve strength in primary movers for cycling, but it is very important to also focus on lifts that strengthen weak muscles underused in cycling. Balance, stability, coordination – On the bike, we are so limited to a single plane of motion, with all of our motions being trapped into the pedal stroke. Including lifts that take you outside of this small area of movement is key for joint health and overall good health. Isolating lifts or lifts that require a bit of balance are especially helpful for cyclists and ensuring we are engaging multiple muscle groups. Lift for better overall health and injury prevention – the goal with strength should not just to be in producing more power on the bike. Thats great and all, but its pretty hard to produce power if you have to take a month off in peak season to recover from a knee injury caused by weak glute activation. Get an evaluation from a personal trainer, coach or physical therapist to find out where your weak areas are. Take care of imbalances now, before something small and probably unnoticeable turns into an injury. Ease into the lifts. The first few weeks should be focused on making sure you have correct form, and can safely do the range of motion for each lift. If you have issues, focus on stretching. This is called the Anatomical Adaptation phase, the point where your body is adapting to the new movements and stimulus. Even just getting one personal training session in during this phase to be sure you are on track with your form is going to be well worth the session. Use caution while increasing weights. Cyclists frequently can quickly add weight to lower body lifts since leg muscles are already strong, but be sure you are not out running weight levels that are safe for the rest of your body to support. Your leg muscles may be ready to up the weight on your squat, but your back may not be ready to support adding more weight to the bar. Focusing on isolation here can help – doing one legged squats instead of standard both legs for example – will help keep weight manageable by not overloading your back, but keeping good challenge to the routine. while also adding the stability and balance.Keep your focus on maintaining balance and good form, rather than overloading yourself with weight. Poor form can allow you to cheat yourself from a proper workout, while also allowing you to add more weight at the same time – so you greatly induce risk of injury. Put your ego aside, lift manageable weight amounts, and always seek professional guidance when possible to ensure you are lifting safely. These are some basic principles important for all cyclists and endurance athletes to keep in mind when including weights. There is a much larger discussion to be had here as well – different weight routines, repetitions, etc. The number of lifts you can choose from are endless, whether you have a few free weights, TRX, kettlebells, or fully stocked gym. Whatever your options, be sure your lifting follows these basic ideas to help keep your lifting on track with a routine that will help your cycling. The details of a weight routine are typically going to vary from rider to rider depending on specific goals, if you have specific questions about weight training and how it may benefit you and your plan, please contact me and I am happy to help out! In my next post, I will cover some basic lifts to include that fit these criteria, but I wanted to start with the framework of what goes into a good plan for cyclists. Use caution while increasing weights. Cyclists frequently can quickly add weight to lower body lifts since leg muscles are already strong, but be sure you are not out running weight levels that are safe for the rest of your body to support. Your leg muscles may be ready to up the weight on your squat, but your back may not be ready to support adding more weight to the bar. Focusing on isolation here can help – doing one legged squats instead of standard both legs for example – will help keep weight manageable by not overloading your back, but keeping good challenge to the routine. This also adds stability and balance. Keep your focus on maintaining balance and good form, rather than overloading yourself with weight. Poor form can allow you to cheat yourself from a proper workout, while also allowing you to add more weight at the same time – so you greatly induce risk of injury. Put your ego aside, lift manageable weight amounts, and always seek professional guidance when possible to ensure you are lifting safely. I have a lot of people starting to talk to me about weight training and how it best plays into their training. There is some debate as to the benefits from weights and cycling, pilule but overall it seems to be a greater benefit than hinderance to most athletes. Some of the benefits for cyclists include: increased power, shop improved joint stability, opportunity to improve muscle imbalances, weight bearing activity for bone density. For some people its just a good way to mix up their training as well and allow a bit of a break from being on the bike all the time, which many riders may find important to maintaining long run focus in training. Previous PostCyclocross Warm up! !Next PostBase miles – be sure your base is SOLID before adding in the intensity!